We love food. And were ready to serve ridiculously good food at your University. We’ve all heard it before. Crappy college food. Burned out Chefs. With no end to either problem in sight, something needed to change. College Chefs Owner, Chef Kevin Gadus, was on a mission to revolutionize the Chef industry. A company built for Chefs, by Chefs. We get it. 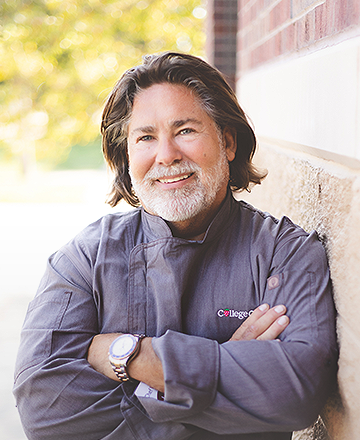 Chef Kevin Gadus was College Chefs, hustling around the University of Illinois in 2008, providing a one-man food service to a handful of Greek houses on campus. Eventually, Kevin crafted a system that provided him the opportunity to harness his passion and creativity for cooking, while spending his nights, weekends, and holidays with his two daughters. College Chefs continues to revolutionize the industry, employing classically-trained Chefs in Fraternities and Sororities across the United States. College Chefs now extends coast to coast, creating Cool Food and giving our Rockstar Chefs the lifestyles they crave: Cook your heart out during the day and live a balanced lifestyle on nights and weekends. we will expand on where we've been by providing even healthier, ethically-sourced food choices for our Chapters, as well as fabulous new benefits for our employees. * We love strawberries to the point where we made it to our logo. "At College Chefs, we have already accomplished many great things when it comes to our people, our food, and our service, and we are proud of what we have accomplished, but we are not yet satisfied with where we are." Gift a rockstar “vacation for two” to all employees after 5 years of service, starting with the sixth year of employment and repeat every 2 years, into eternity. What we mean is we will actually buy them a ‘trip to paradise’ every 2 years and force them to take it! We think this is legal. "These goals will not be easy to put into practice, but they are achievable. We will continue to confront our own challenges and raise the bar we have set. If we strive to push the envelope for bettering our people, our food, and our service, we will continue to blaze a trail and widen our position as an industry leader in Sorority and Fraternity Food Service." If you’re a Chef looking for something a little different, why not give College Chefs a try? We think that you’ll love the freedom the job allows. Are you looking for a Sous Chef, Kitchen Assistant, or Dishwasher position? We think you'll love us too! The work culture was great. I was given lots of creative freedom. Good work and life balance. Good insurance benefits.Lots of paid days off and good support from management.